While enrolling my daughter in a good preschool, I hadn’t bothered to inquire much about the other good preschools in the area. I was more than happy with the facts that the preschool was good and so close that I could walk my toddler to the school. And of course, the fee was affordable too. But later as I talked to my friends who had visited all the schools in the vicinity and stressed themselves out before settling on a good preschool for their child; it made me wonder about the wisdom of my decision. Had I settled for less? So I made an agenda to find out about the preschools to know what the commotion was all about. You can learn about them in detail on this link. Every program has its own approach and philosophy that benefits the child. No program is less or more. Hence, your child will do well in any program. So don’t stress your pretty head thinking too much about it. India is seeing a surge in nuclear families which has taken a toll on our child’s social life. A child hardly gets to interact with others. Hence, putting him in a preschool serves this purpose. More than worrying about the program or school status; focus on the child interacting with teachers and his classmates. Fees: Now that is another bone of contention. I came to know that there are preschools charging more than 1.5 lacs for an academic year. To say I was shocked will be putting it too mildly. I was flabbergasted. 1.5 lac for tiny tots? What does the school have to offer? Gilded walls and chairs? Come on, isn’t it ridiculous? And still, parents rush to enroll their kids there. Pamper your kids all you want to; but this kind of pampering doesn’t do well. Kids learn a wrong lesson, of materialism. If you have money, don’t throw it. Use it wisely. Save it for higher education when the child would actually need it. But sometimes peer pressure plays an important role. If people in your social circle have put their kids there; you are more or less pressurised into doing the same. Proximity: Preschools start accepting kids as young as 13-15 months old. And usually school duration is 2-2.5 hours. 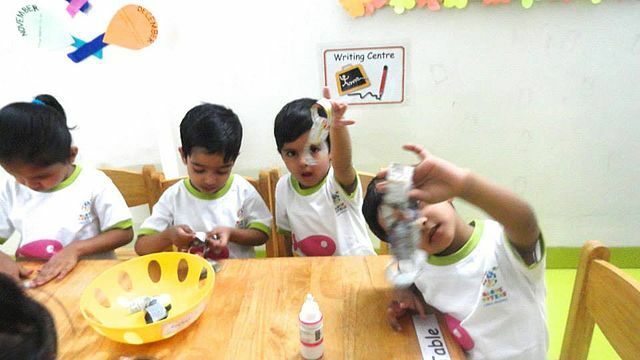 Choose a preschool which is close by so that you and your child don’t waste precious time in commuting. A child after the school is very tired; if he is on the road for too long he is bound to become cranky. Also, add the commuting fees (school vans/buses, private autos/cabs or petrol) too to your school fees. Activities: Find out what sort of activities the school undertakes? Do they celebrate festivals and days? Do they take kids regularly on field trips (aquarium, garden, supermarket, florist etc.)? Do you need to accompany the child or does the school teachers take care of it? For every field trip that my daughter’s preschool organises, I need to accompany her. It’s taxing for me. If I want to take her out, I shall do it in my sweet time. Why should I be bound by her school timing? Isn’t that something the school should take care of? Size: Also look at the size of the school. Yes, size does matter. I had visited a preschool that was in the next lane. But it was such a shabby little place running out of two commercial shop with no proper play area for the kids. Kids could not be brought out as there were paan/bidi shops where people smoked. Is it any wonder then that I immediately put a big cross on the school? Teachers: When you first visit the school, it’s natural that the school counsellor will be extra nice to you and won’t leave your side before she has convinced you to write a check. But try to engage with the teachers as much as possible. Because those are the ones your child is going to be with all the time. Find out how expressive the teachers are. Do they talk nicely to you? Do they look the kinds that will give your child’s report as you ask? Parents: Nothing will give you a report on the school better and faster than talking to fellow parents. Talk to parents about their experience with a particular school. Are the teachers good? Do they encourage a child to come out of his shyness and engage him in activities? Is their kid happy and shows readiness to go to school? Though this is no benchmark for a school or its teachers being good, it shows a school’s willingness to draw in shy and introvert kids. If the playgroup is affiliated to a bigger school, don’t hesitate to put your child in it. During admission, most schools give preference to children of their playgroup/preschool. It will secure your child’s seat in that school. Lastly, don’t make such a big deal out of the preschool. The child goes to the school to interact with others and learn social skills. Whatever else he learns is bonus. Let him enjoy his wonder years. If you liked this article on good preschool, this post on what to consider before you choose a good school for your child might help you too!